How does the label stick to the piece? It is not an ordinary label as there is no glue on it. It is a label made of the same material in which the product is made. Due to the temperature and pressure of the molten plastic being injected into the mold, the label is imbedded in the wall of the object and thus becomes an integral part of it. Which technology is used for decorating the labels? What is the quality achieved? Various methods are available for printing the labels. Flexo, gravure, offset, screen, digital, etc., are all suitable printing technology and, depending upon the technology chosen, varying quality degrees can be reached. Offset printing, for example, can reproduce a perfect photographic image on the label. Is it possible to remove the label once applied? The plastic label is permanently imbedded into the plastic and the product and label become one only object. There are no edges on the label that may possibly give rise to peeling off (so-called “no edge advantage”) and it is impossible to remove if not by grinding the molded object itself. 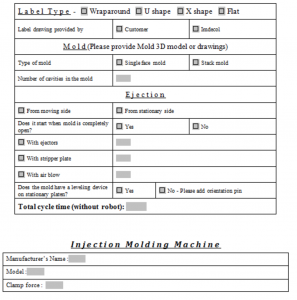 Can a mold not specifically designed for IML be used for IML production? The answer is “YES, subject to verification”. 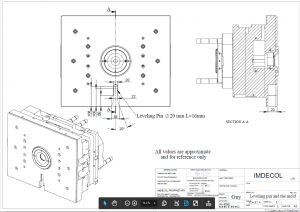 In many cases only minor modifications are necessary to enable to use the same mold for IML production. In other words, it is possible to totally change the appearance of a product while continuing to use the same type of shapes and the same molds. Are significant financial investments necessary? In terms of technological equipment, certainly YES; but these heavy costs have already been covered by us. In terms of development and labels production, absolutely NOT. Why is IML better than other types of stickers and decorations? Because the label, in becoming an integral part of the object itself, is impossible to remove, has a guaranteed longer life and reduced costs since it allows to eliminate all post-mold labeling operations and equipment. 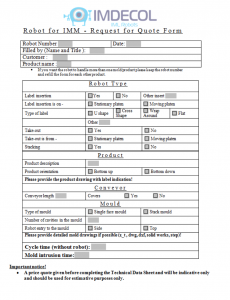 While sending you the RFQ, we need to fill only Robot for IMM RFQ? 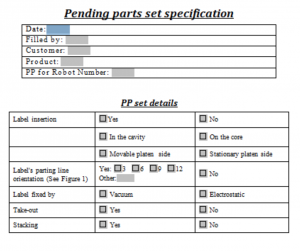 What’s PP request data sheet? 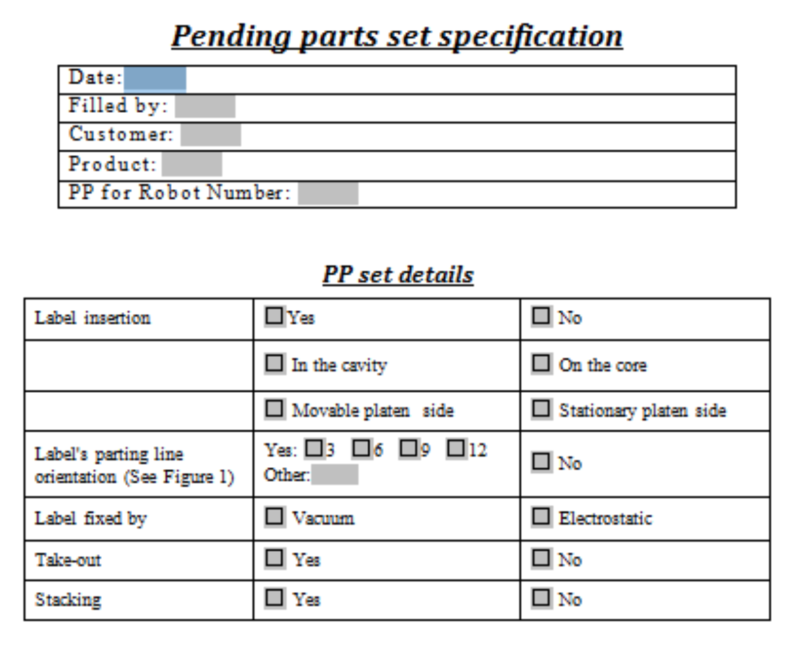 PP stands for Pending parts, i.e. 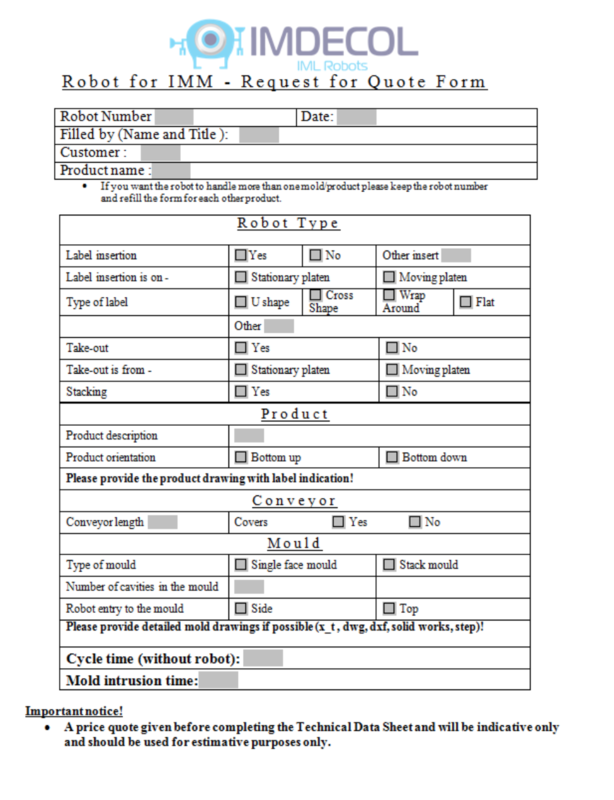 Set which enables manufacturing different product on the same robot. What is parting line orientation? What is label type X shape? 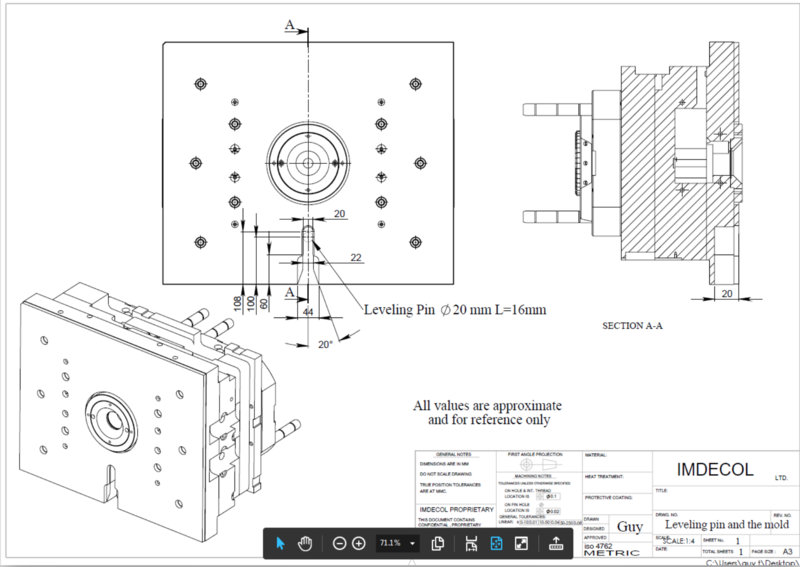 Does the mold have a levelling device on stationary platen? Device which ensures mold will be mounted in the same position each time it mounted in the IMM. Example attached. Socket connection for Robot normally coming in Japanese machines is JIS provided as std. feature. However, as option Euromap 67 or 12? We work with Euromap protocols. However special connection protocol can be discussed. Cylinders on mold should be controlled from the robot. What’s the meaning? 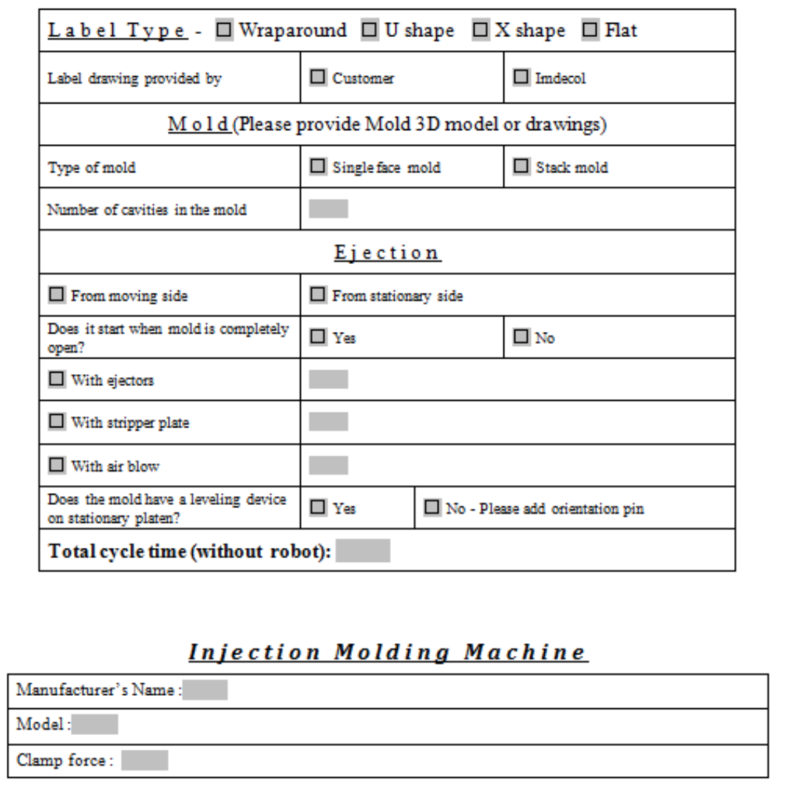 In some applications customer wants our robot to control features in the mold .